Where is shovel to unearth statuette under swing? I have everything up to digging under the swing for the statuette to unlock gargoye gate. I even did something I don't like to do and that is to go back through the walkthrough frame by frame. Found no mention anywhere about obtaining a shovel. Re:Where is shovel to unearth statuette under swing? I checked our Haunted Hotel: Charles Dexter Ward Walkthrough, and it looks like you can find the shovel in a crate in the basement of the hotel (where you fall through the floor). 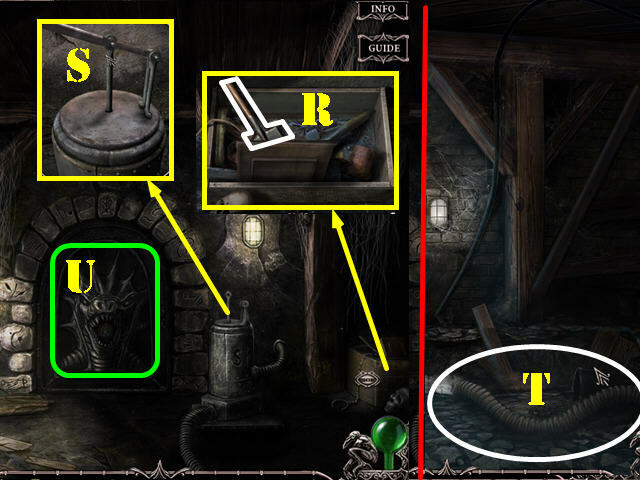 You can click here to see a screenshot of that spot in the game (the shovel is marked "R") or the other blue text above to go to the full walkthrough. Thanks. I went back through the walkthrough again much slower and also found it. Thanks again for your reply.